As the name suggests, Air is used as the media in an all air system. Air transports thermal energy from the conditioned space to the HVAC plant.All-Air Central Systems supply the latent and sensible cooling capacity with cold air ducted to the conditioned space. Heating is accomplished by the same air stream, either in the central system or in each zone controlled by a thermostat. In these systems air is processed in the A/C plant namely AHU (Air Handling Unit). AHU consists of Dampers, Mixing chambers, Filters, Cooling/ Heating coils, Humidifiers, Fans/Blowers etc. in a packaged cabinet.This processed air is then supplied to the conditioned spaces through Air Distribution system. Air Distribution system consists of Ducts, Dampers and Diffusers. It will transfer cooled or heated air from a central plant via ducting, distributing air through a series of grilles or diffusers to the room or rooms being served. This air extracts (or supplies in case of winter) the required amount of sensible and latent heat from the conditioned space. The duct that supplies the air to spaces is called Supply Air Duct (SAD). The return air from the conditioned space is conveyed back to the plant, where it again undergoes the required processing thus completing the cycle. 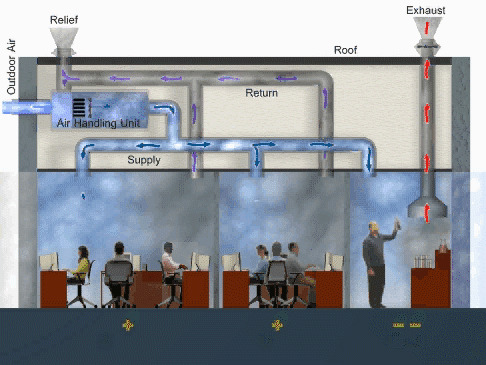 The duct that returns the air from spaces to A/C plant is called Return Air Duct (RAD). It normally comprises the cheapest equipment cost, but is not necessarily easy or cheap to install in a building due to the size of ducting required and the cost to install. 5. Dual duct, variable volume (VAV) system. Simultaneous cooling and heating in various zones. Effective Room air distribution and Ventilation is possible under widely varying load conditions. All air systems present great opportunities for Energy conservation such as heat recovery wheels. Precise control is possible by use of high class controls. Close range of Temperature (± 0.15ºC) and Humidity (± 0.5 %) can be achieved. Maintenance is performed in unoccupied areas, since major equipment is centrally located. Simultaneous cooling and heating can be provided by dual duct system. Also, switching between summer and winter mode is quite easy in All air systems. No drain piping or power wiring or compressors are located in occupied areas. AHU which is a complete package can be remotely located, well away from conditioned spaces. It helps to reduce noise levels in occupied spaces. Stairwell Pressurization, kitchen ventilation etc. can be easily achieved. Since systems are quite large in size, require separate spaces like AHU Room. It reduces use of effective floor space. Particularly in high rise buildings, it is difficult to provide long runs of ducts, as AHUs are located either on roof or basement. Duct space may add to the building height and vertical air shafts detract from usable space. Large systems may be difficult to air balance. Close coordination is needed between designers and installers to assure accessibility to terminal units.Difficult to install in existing buildings, as large space is required in false ceiling to lay the ducts. Testing, Adjusting, Balancing (TAB) may be very difficult task in case of VAV systems. 1. Precision HVAC applications such as IT Data centers, Research Labs, Process industries, Clean rooms, Operation Theaters, Hospitals etc. where accurate and precise control of space environment is required. 2. Theaters, Auditorium, Functional halls, Retail stores etc. where loads are uniform with small external loads. 3. Large corporate buildings with varied requirements of heating and cooling which can be served by Dual duct systems with simultaneous cooling and heating. 4. Multi zone All air systems are suitable for Offices, classrooms, hotels, ships etc. where individual control is required.